I know most folk in the US of A have freezing weather this time of year and the only comfort they find is curling up in a cozy chair with an afghan and their favorite seed catalogue, dreaming of warmer days. If that's you, you have my sincere sympathy! But here, where I live, gardens are growing! 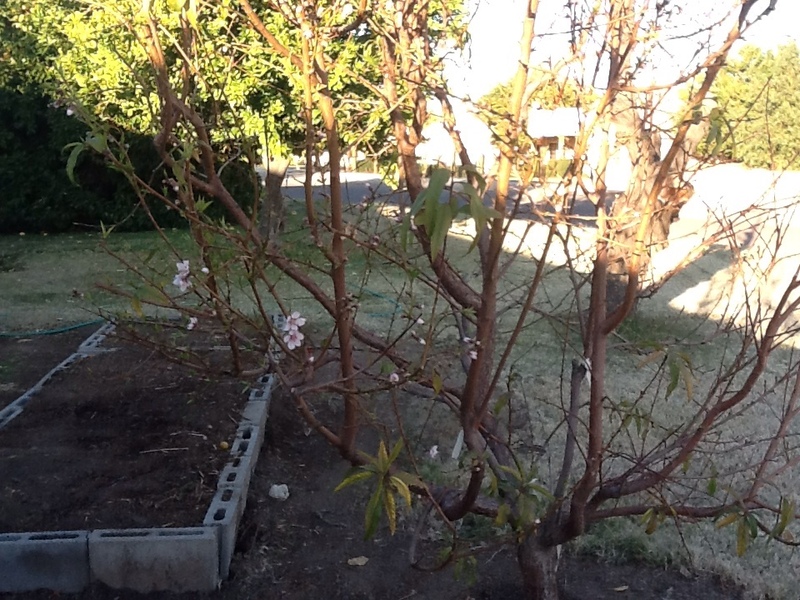 Orchards may even have a bloom or two . . . this is my peach fruit cocktail tree. Our tree has 5 different peaches grafted into it giving us fresh peaches from the end of April through the first of July! 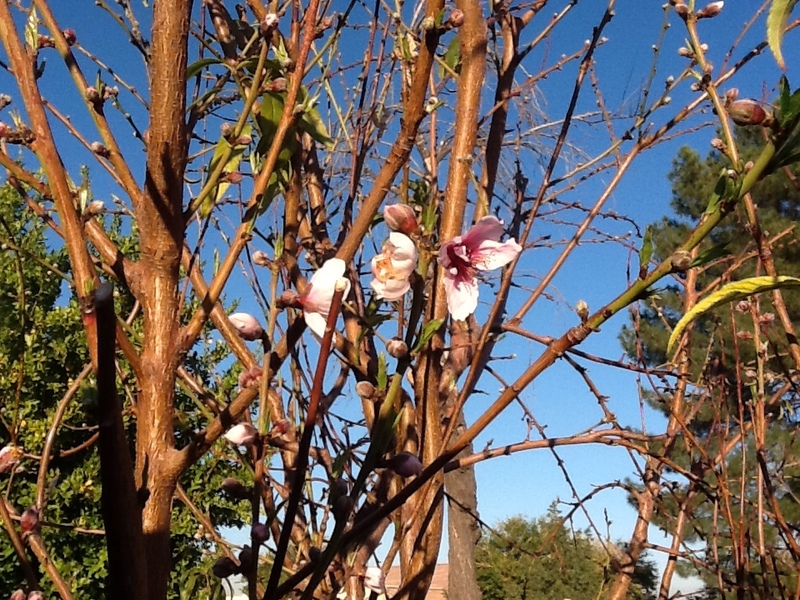 These blooms are from Eva's Pride, our earliest, stone-free peaches. In the background you can see my new raised garden that Will put in for me! There is also a small section behind me with newly planted Sugar Snap Peas. Rhubarb is my most prized fruit! I absolutely love rhubarb! Lots of folk like rhubarb or strawberry-rhubarb pie but give me a salt shaker and a long stick of rhubarb and you've got a happy girl! In most places rhubarb is a perennial, meaning once established, the plant pops through the ground every Spring. Here in the desert we grow Victoria Rhubarb as an annual, which is fine by me! I went 27 years without my beloved rhubarb before discovering I could grow this glorious fruit! Moving on . 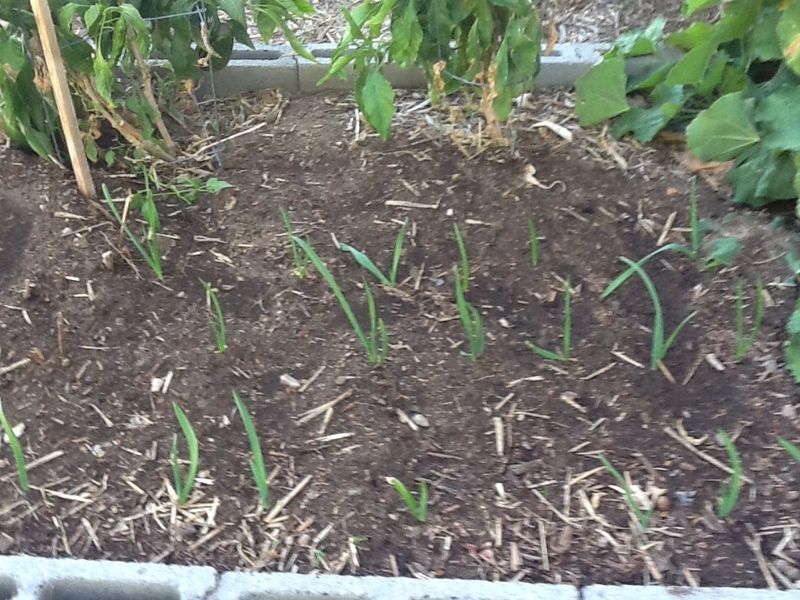 . .
Garlic is up and growing. I planted this garlic from last year's harvest about a month ago. 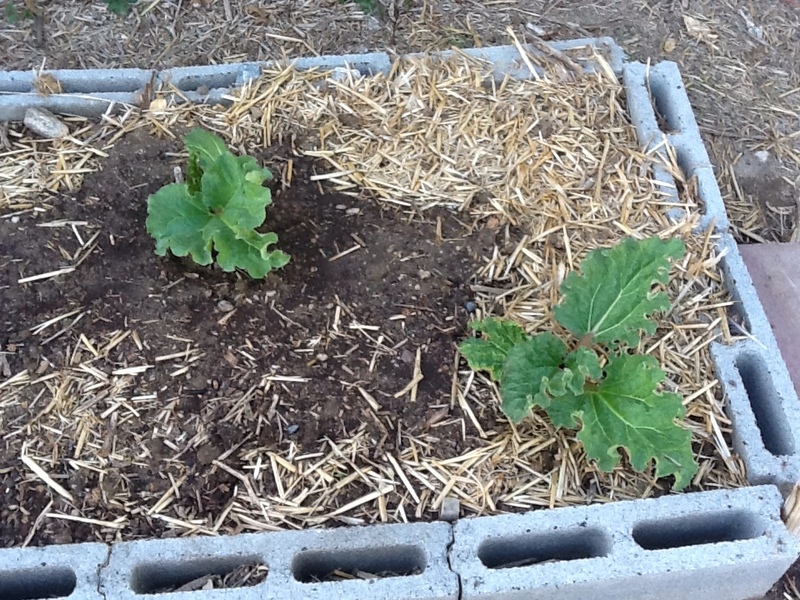 Broccoli and cauliflower are growing. 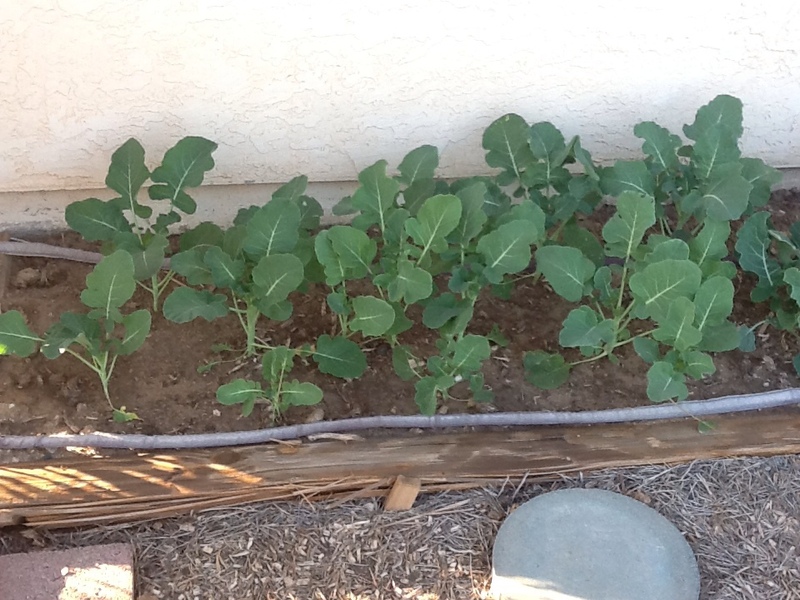 This is my second batch of broccoli. Home-grown broccoli is so tender and tasty, we eat the broccoli head, stem and even the leaves! Yum, Yum! Leeks. 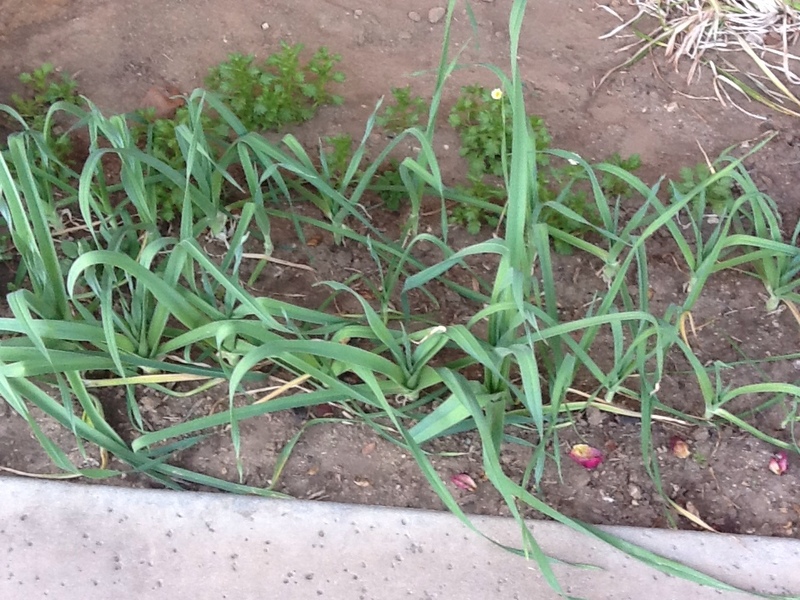 I planted leek seeds once, years ago. Now, each summer they flower, cast their seeds and I just transplant baby leek plants into nice even rows and the whole process starts all over again. Today I used one of my leeks to make Chicken Alfredo. I used garden leeks, sweet, tender garden carrots and our own dried garlic. 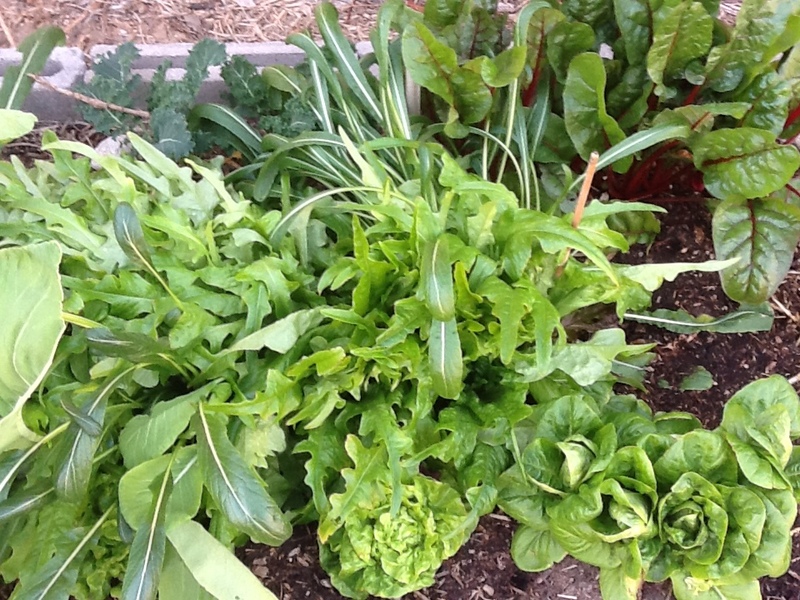 This is my mixed leaf lettuce. In the back, from left to right, is dwarf kale and Swiss chard. I also am growing Little Gem romaine. A lot of the leaf lettuces are OP or open pollination, which means I can let a lettuce plant flower, go to seed and harvest the seed for next year's fall planting. The seeds are cute. They come attached to fluff that we always called "Santa Clauses" as kids. The fluff catches the breezes and is carried off on the wind to reseed. After the little, yellow flower is pollinated it closes back up. When you see white fluff showing, snip the dried flower and bring it inside or your seed will fly away! I use a metal sieve to shake my seed through, leaving the fluff in the sieve and the seed falls below into a bowl. I let my seeds dry for a couple more days before I store them in little plastic containers. 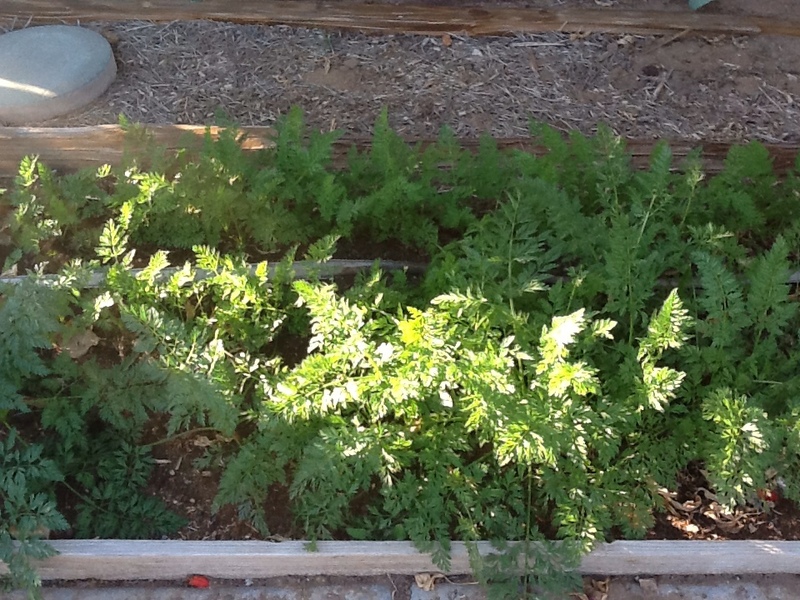 This is my carrot patch. I unknowingly saved hybrid seed from last year's crop. I didn't really expect to have a very good crop of carrots but, they are wonderful, long, straight 8-inch sweet, beautiful carrots. I really lucked out! 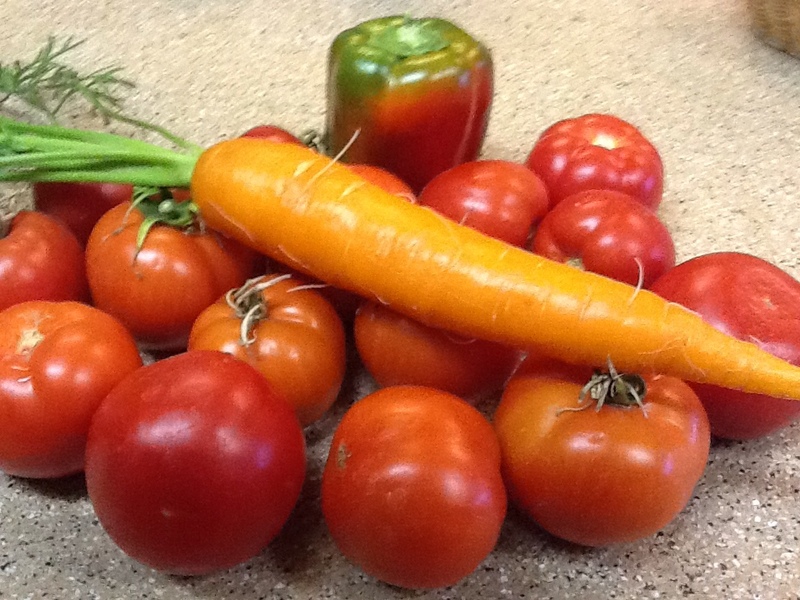 Here's one of my carrots and part of our tomato harvest, with a red pepper thrown in. The tomato plants look too ratty to show a picture of them. These are my red bell pepper plants. 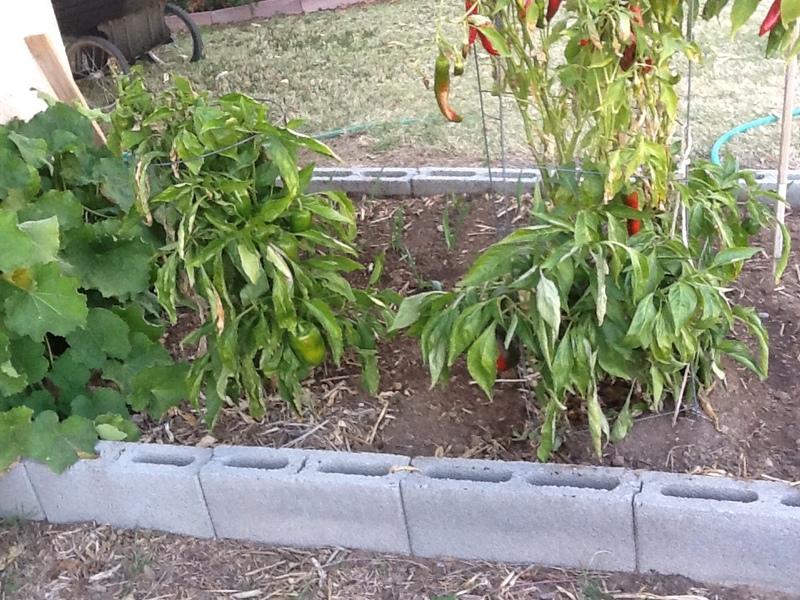 The plant on the right has a hot pepper plant growing out of the top of it. I don't know how it happened but the hot peppers have a unique taste, both sweet like a red bell but with heat! 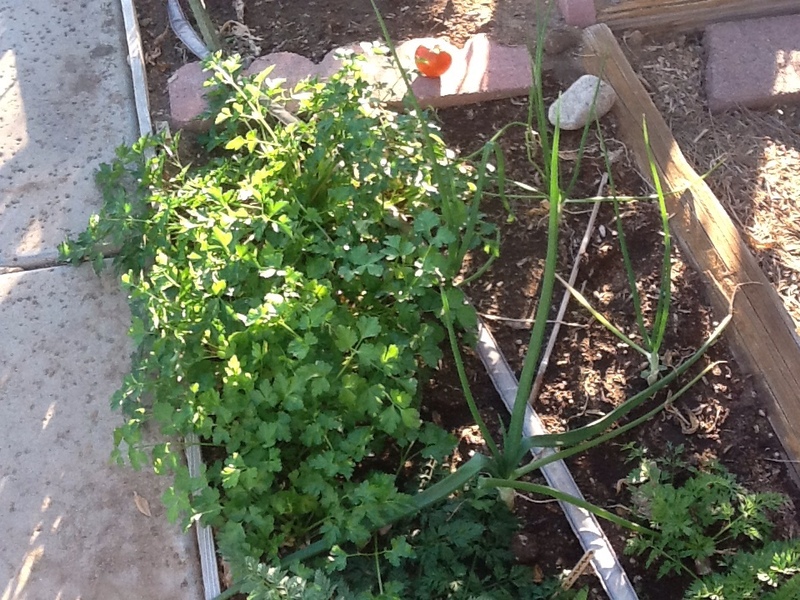 Italian parsley and Walla Walla sweet onions. I am also growing rosemary, thyme, chives, mammoth dill, and oregano in large pots. In February we will be planting Yukon Gold potatoes, sweet potatoes and yellow onion sets. This will be our first time growing potatoes and we are really excited because we are potato lovers and homegrown always surpasses store bought produce. What do you have growing right now? Do you have an inside herb garden? Or are you looking through seed catalogues trying to decide what new veggies you want to try this year? You forgot to mention that one plant you have allowed to go to bloom ... for the bees. I really enjoy seeing beautiful pictures of your garden. I have tasted your fresh vegetables and juicy fruits. There is nothing like making a salad with homegrown and freshly picked veggies!! You are so right about that, especially when it comes to vine ripened tomatoes, peaches and plums!